This build is a hot fix for 110 that caused problems when some layers were organised into layersets that weren't animations. Please test this build and let me know of any major issues! Thanks! Last edited by Cliff Cawley on March 31st, 2009, 12:19 am, edited 1 time in total. Which it did not resolve but instead enabled the crash for me. But it was more of a freeze, the only way I could close Xion was to goto the Xion main window via alt-tab and alt-f4 out. Just so you guys know. I am in suspicion to think that the area indicated by transparency in my playlist is a space left open for album art? sorry for double post but I don't think its anything I said above (for the playlist issue im having), I've narrowed it down to me not having a scrollbar. But that doesn't explain why it's leaving the blank area on all different sides depending on how I resize the playlist window. It would explain it better if it only did it to the right side of my playlist. I'll continue my investigation into how and why it is performing like this...im just gonna add a quicky scrollbar and see if that fixes it. Can you please send me your Interface in a form that it causes it to crash Xion? I'd like to fix the crashes so that they don't occur. On taking a look at your skin I can also suggest how you'd better be able to use the functionality as it seems like there's a bit of confusion on your part. Anchoring IS automatic, but only to the closest side. If you want to do something tricky then you need to manually let Xion know what else needs anchoring. Have you checked out what the Default Playlist does? It was amazing to come home to that fast build. The Glare project and the new sdk and the way the albumart switches now are awesome, and those are only a few of the great new things! I'm still missing the same layers, still can't crash the playlist. edit: thought I'd add one of the skins w/ the missing layers doesn't have any sliders at all, this one does.Nothing is grouped either, 'cept anims. I can't crash it with build 111 at all. I don't even get the holes that you had in your screenshot. There was even a scrollbar in that version. Did you upload the wrong version of the the psd? xonenine Wrote: I'm still missing the same layers, still can't crash the playlist. Ah! Found another bug related to the animation objects as sliders! Thanks for reporting this one xonenine, I've now also fixed this one! Its only a bug when working with the layer switch keyword though, so its not as high priority. I think I'd like to get some more feedback first and make some other changes before releasing 112. Is that ok or will it be stopping you from progressing in your skins? Is anyone else using the layer switch keyword or is xonenine the only one? Cliff Cawley Wrote: Is anyone else using the layer switch keyword or is xonenine the only one? 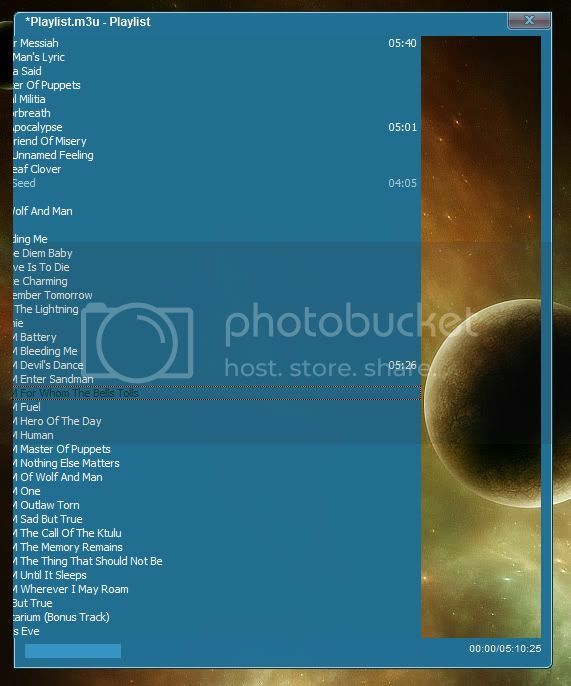 The playlist I posted fixes the hole in the playlist, it was explained how I fixed it so if you want to reverse engineer back to the hole just simply fill the space where the scrollbar is (all layers and space it fills) on the pl_list layer. except for the part that goes below the currently filled space of the pl_list, that was put there to fill another hole that was left behind. But to help you crash Xion with the playlist, drag the playlist resize from the bottom right till its bigger than the original size, then let go and re-drag it over itself multiple times kinda fast: it'll fill the pl_list area with random stuff and eventually crash, time differs each time I do it. 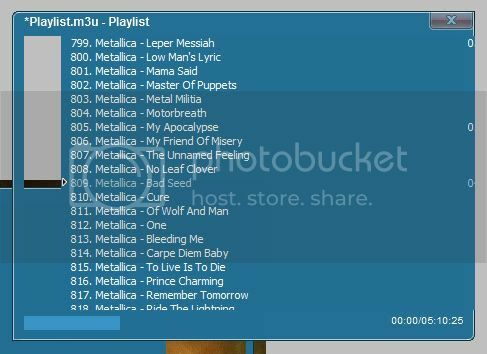 Jikaru Wrote: drag the playlist resize from the bottom right till its bigger than the original size, then let go and re-drag it over itself multiple times kinda fast: it'll fill the pl_list area with random stuff and eventually crash, time differs each time I do it. had the same problem here (XP System, Vista check later), but only when dragging fast and chaotic.. I can no longer use the hot buttons on my keyboard, even after attempting to configure the Hot Keys. I'm not sure how it works with my keyboard, but Xion is trying to add CTRL+ ALT + [key], which is not what my keyboard sends. If there was an option to disable the auto-manipulation of my assigned keys I don't think this would be a problem. I just updated to this beta from the current release on the home page. I believe my Global Hot Keys are not working because Xion is forcing it to use a key combination with CTRL + ALT, which my keyboard does not support. I am able to use the keys on my keyboard after going into the Xion Configuration window and then immediately pressing the Close button. Anything I do after this point renders my key presses useless. If I click in this box, It not longer works. Same for my desktop. Even if I open up the Xion Configuration window it stops working. Also, the keyboard I am using is a Razor Lycosa. Spotted a bug regarding sliderbits, just the regular old single layer ones. They are aligned correctly when you're not touching them, but when you click and drag them, the top of the sliderbit snaps to the bottom of the actual slider base, so the whole bit moves downwards on drag. This has just appeared in either 110 or 111, probably 110 seen as this is just a quickfix build.